150 years ago this week an unusual discussion took place at the White House. On a mid-April morning Maj. Gen. Benjamin F. Butler met with Abraham Lincoln to discuss what Butler later recounted as a proposal to resettle several thousand freed slaves on the Isthmus of Panama. It would prove to be their final encounter, as Lincoln was assassinated a few days later. This revelation altered a longstanding tendency to dismiss Butler’s story outright. Owing to memory-induced timeline confusion and the lack of a precise date in the most famous version of Butler’s telling, his 1892 autobiography, a number of historians – notably drawing upon a case made by Mark E. Neely – dismissed the story unreliable. The two men, according to this theory, were not in Washington at the time Butler reported, leading several historians to conclude that the entire story was an implausible fabrication by a discredited military commander who was attempting to revive his reputation by implying that he retained Lincoln’s confidence at the end of the latter’s life. I’ve since examined Butler’s timeline at length, including its consistency with a lesser known version of the story that Butler wrote in 1886. I also discovered further corroboration in an earlier 1884 account of the same episode that appeared in the New York Times and explicitly placed the meeting a few days before the assassination. While I strongly encourage the interested reader to review my extended comments on the remaining questions about Butler’s memory, I conclude that the 1886 and especially 1884 timelines are in fact consistent with the evidence. 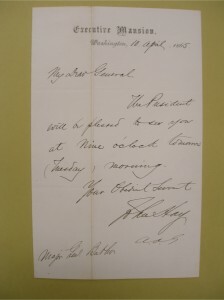 Briefly recounted, both Lincoln and Butler were in Washington from the time of Lincoln’s return from Richmond on April 9 to Butler’s departure to New York on April 14, shortly before the president’s death. This period provided ample opportunity for the two encounters Bulter described, including the meeting we know for certain to have taken place on the morning of the 11th. I. Butler isn’t the only reason to believe that Lincoln remained a colonizationist at the time of his death. Lincoln’s support for colonization exhibited a longstanding consistency dating back to at least the early 1850s, and no evidence has ever shown that he altered or repudiated this belief. While it is often claimed that Lincoln “sloughed off” this position due to a July 1864 diary passage by John Hay about Congress’ rescinding of the colonization budget, a different contemporary report by Lincoln’s colonization agent James Mitchell indicates that Lincoln told him this was an “unfriendly” rider to a needed federal budget bill. Attesting to his continued interest in the policy, Lincoln spent much of the fall of 1864 supporting Mitchell in a legal case to have his salary and colonization duties restored. This includes a now lost but logged letter from September 1864, where Lincoln directly endorsed Mitchell’s petition and asked the Attorney General, Edward Bates, for a legal opinion sustaining him. Bates gave an answer on November 30 as he was departing office, though it only covered through the end of the year and left the question unsettled. More telling though is that a serious effort was under way to reestablish Mitchell’s office and part of his funding as late as February 1865. The push even received the endorsement of Thaddeus Stevens, the radical chairman of the Ways and Means committee, on the same day that the 13th Amendment passed congress. Consistent with these events, a fair amount of Washington chatter also hinted that some sort of colonization function would be attached to the newly formed Freedman’s Bureau (Mitchell himself was likely under consideration for a transfer to this agency. Several prominent politicians and Illinois associates of Lincoln circulated petitions in support of his appointment to a post at the newly-created Bureau at the time of Lincoln’s death). A number of politicians – even radicals like Kansas Sen. Jim Lane – were also actively touting internal colonization schemes to resettle freed slaves in the American west or on abandoned southern lands. Colonization, then, was hardly outside the political norm in 1865 at the time that Butler held his meeting. Absent compelling proof that Lincoln actually changed his mind on the policy, there is little reason to believe that he had abandoned his longstanding views on the subject. Butler likely witnessed yet another consistent expression of the same beliefs. II. Colonization & black military service: not as inconsistent as one might think. A second common argument for dismissing Butler is the assertion that Lincoln’s acceptance of black troops negates the very idea of resettling them abroad. To paraphrase one such argument, how could Lincoln colonize a group of people after asking them to join in the fight for their freedom at home? This argument completely misunderstands the nature of Lincoln’s colonization program, and conflates a loose competition between the soldiering of freed slaves and resettling them abroad for an inconsistency that is simply not attested in the historical record. Lincoln’s colonization program was always a strictly voluntary measure – a feature he aggressively maintained and defended even as others in his cabinet pressed him to consider forced deportations. His purpose, misguided though it may have been, was never to force the freedmen abroad – be they soldiers or otherwise – but to entice them to go there with federal support and subsidy. As he told a black delegation to the White House in 1862, colonization offered a new life for “when you cease to be slaves.” His energies were always aimed at convincing them of this option, not forcing it upon them. Given the voluntary nature of Lincoln’s colonization program, the tension between colonization and military service has been overstated. If anything it was strictly a practical tension in that the mid-war colonization schemes competed for manpower among the freed slaves at a time when their enlistment was of increasing importance to the war’s military objectives. As a result the War Department often frowned upon colonization and even, at times, obstructed its progress against the president’s wishes. Yet this antagonism ceased to be an issue in April 1865 as the war drew to a close, precisely the time of Butler’s meeting. As to the supposed philosophical inconsistency between colonization and the soldiering of African Americans, it is largely a modern invention. Even Mitchell – the main colonizationist in Lincoln’s White House – actively and simultaneously supported the creation of black units to subdue the rebellion. As this letter to Lincoln from July 1864 attests, Mitchell actively urged the president to raise “a colored corps in which” the state of Kentucky “will finally take pride, if they are finally to be used on the south western border” as part of the war effort. As a slaveholding northern state, Kentucky had not been subject to Lincoln’s emancipation policy. Black enlistment from the state including as an option of hired substitution to the draft, Mitchell believed, would alleviate its hostility to emancipation and strengthen Kentucky’s commitment to the union cause. Note that he saw no contradiction between this policy of encouraging black enlistment and the voluntary colonization program he was simultaneously advancing. Like the military service argument, Lincoln’s limited endorsement of black suffrage – including in a speech on the same day as his meeting with Butler – is often cited as “proof” of his abandonment of colonization. Why this is so is seldom elaborated upon though, particularly given the aforementioned voluntary charge that Lincoln always attached to his colonization program. Lincoln famously suggested his personal preference for the extension of voting rights to the “very intelligent” blacks and “those who serve our cause as soldiers,” though he also deferred final judgment on this question to the states in question – in the case of his speech, Louisiana. Yet suffrage also played a part in Lincoln’s case for colonization. Resettlement abroad would secure this right as well, and perhaps faster than in the United States where substantial political opposition existed. As he told the audience of his 1862 colonization address, “You are cut off from many of the advantages which the other race enjoy.” Lincoln’s investigation of possible colonization sites in the British West Indies in 1863 similarly carried instructions to secure political rights for the prospective colonists, and an American investigative mission to British Honduras posed that question directly to the colonial government. Why then would Lincoln’s cautious turn to black suffrage in the United States be in conflict with a voluntary colonizationist position that already endorsed black suffrage abroad? When the two positions are understood as simultaneous experiments, and colonization as a strictly voluntary proposition, the alleged tension that modern writers have imputed to the two dissolves. One of the more fascinating features of Butler’s story is that it paired colonization with another endeavor more commonly associated with the era of its publication in the 1890s than the Civil War: the digging of the Panama Canal. Butler no doubt wished his name attached to this venture, particularly in his 1892 autobiography, which contains the last and most embellished of the three versions of the story. Yet the Panama Canal was more than idle chatter in 1865 as well, and its connection to colonization runs deep. Lincoln had actually alluded to the prospects of a canal project in his 1862 colonization pitch, noting “the particular place I have in view is to be a great highway from the Atlantic or Caribbean Sea to the Pacific Ocean, and this particular place has all the advantages for a colony.” By 1865, the isthmian crossing had acquired increased strategic importance for the movement of troops between California and the east. At the very moment Butler and Lincoln were meeting, the State Department had dispatched a special envoy to the region to ascertain the Colombian government’s position on the right of isthmian transit as well as the possibility of a canal. In the years following the war, the same canal efforts led to an unsuccessful treaty between the United States and Colombia in 1867, and a U.S. Navy mission to survey crossing routes in the early 1870s. The appeal of a canal project was plainly the subject of much discussion at the time of Butler’s meeting, as well as historically associated with Lincoln’s earlier colonization attempts in the Chiriqui region of Panama from 1862. But also notice the parallels between Butler’s recollection and another contemporary proposal that was being floated by no less a source than Ulysses S. Grant. Butler claimed that Lincoln asked him about using the U.S. Colored Troops to commence the canal project as part of the colonization effort. In November 1865, Grant responded to a State Department inquiry about the government’s isthmian policies with a proposal of his own: the army, he said, should oversee the construction of a canal. As Grant’s letter to William H. Seward continued, “colored troops could be sent in sufficient numbers to guard the surveying party against hostile Indians and to do all the labor upon the land.” While Grant likely did not envision a specific revival of colonization in connection with his proposal, both the military supervision of the canal and the employment of the USCT bear striking similarity to the proposal that Butler attributed to his final conversation with Lincoln. Whatever the practicality of the endeavor (and colonization was persistently plagued by its impractical execution), the canal project that Butler described is actually very reflective of Lincoln’s known thoughts on the isthmus and discussions that were being held at other high levels of the government in 1865. Butler’s personal character inevitably emerges in discussions of the 1865 colonization anecdote, and should be fully considered when evaluating its authenticity. Unfortunately his reputation is often used as a reason to dismiss the story outright, with little further consideration. There is no doubt that Butler was a self-indulgent and politically ambitious individual with many dubious traits and characteristics. Yet this does not translate into an excuse to dismiss all that he ever said. Given that Butler also witnessed many important events in the Civil War and – as we have seen – enjoyed personal access to President Lincoln up to the final week of his life, it would in fact be a mistake to write him out of consideration. So where does this leave us in assessing the veracity of Butler’s account? The most common argument against Butler appeals to an unstated motive for the story in which the politically ambitious general is assumed to be propping himself up as a racial liberal by attributing colonizationist views to a “less enlightened” Lincoln. Yet this modern supposition – and it really is nothing more than that, having no historical attestation – reflects a projection of late 20th century racial views backwards upon 19th century actors that saw colonization very differently. Colonization was well within the political mainstream at the time of the Civil War (it attained $600,000 in direct federal funding in 1862), and its vestiges lingered through the Reconstruction era among more conservative elements of the Republican Party. It was also strongly associated with Lincoln himself. In other words, a 19th century reader had no particular reason to believe that Butler was propping himself up at Lincoln’s expense by stating something that was perfectly consistent with what most people of the time already knew about Lincoln’s colonization views. We might similarly note that Butler himself, though not a consistent colonizationist, vacillated between the policy throughout his own political career. As late as 1877, he was still entertaining colonization as a possible means of allowing blacks to escape the oppression of the post-reconstruction South. As he wrote in a letter to a constituent on April 6, 1877, “I think your suggestion of colonization is a wise one.” In light of this evidence, the claim that Butler was trying to prop himself up vis-a-vis Lincoln in the 1865 anecdote lacks any basis in historical reality. What then was Butler’s motive for the story, if not to recount an event he witnessed? Recall that Butler’s story appeared in print three times: 1884, 1886, and 1892. This occurred during the lifetime of many other Lincoln contemporaries, and Butler – ever the shameless self-promoter – ensured that these works were widely disseminated. He purchased over a thousand copies of his own autobiography and mailed them to members of Congress, veterans of the Civil War military leadership, cabinet officials, presidents, and other public figures including Frederick Douglass and former first lady Julia Dent Grant. As a result the 1865 colonization anecdote became widely known in Butler’s own lifetime and added to the corpus of Lincoln biography. The colonization story’s dissemination is telling, because other portions of Butler’s reminiscences sparked intense political controversy – particularly a festering rift with Admiral David Dixon Porter, and clashing with John Nicolay and John Hay over other details of the Lincoln White House. His account of the 1865 meeting went unchallenged by literally hundreds of still-living contemporaries who knew Lincoln, knew the circumstances of the war, and viewed it as consistent with Lincoln’s recorded views on colonization. Indeed the first real skepticism of Butler’s colonization interview did not appear in the historical community until the 1950s and 1960s – a time when the influences of the emerging Civil Rights movement prompted an overdue but not entirely unbiased reassessment of its parallels in Lincoln’s own racial legacy. Taken in sum, the dynamics of historical memory suggest that skepticism over Butler’s story is largely a modern construct and one that has become alarmingly detached from the contextual particulars of the episode in 1865 and its subsequent recording and dissemination by Butler. This carries the caveat that Butler did indeed tend toward embellishment of his own exploits, including the 1865 interview with Lincoln. This is plainly seen in a comparison of the textual dialogue between the 1884, 1886, and 1892 versions. As distance from the actual event extended, Butler’s attributed conversation becomes longer, more specific, and more detailed. Some of those details chafe with reality, such as Butler’s increasing propensity to name himself as Lincoln’s chosen administrator of the program as well as side dialogue in which Lincoln praises his dubious abilities as a military commander. Yet the core of the story remains consistent with its earliest form in 1884, which contains few if any of these later embellishments. All considered, the core of the Butler colonization anecdote rings truthful. It likely consisted of a simple conversational entertaining of the idea by a president who was facing the vast uncertainties of a post-war and post-slavery United States. The proposal also plainly never developed beyond this conversation. Lincoln’s assassination also played no small role in the end of the government’s colonization efforts, though it is also impossible to know if it would have gained traction in his second term. Yet a final discussion of colonization on or about April 11, 1865 is itself consistent with Lincoln’s views on a policy that he always professed to support and that formed an important, if neglected, part of his own gradualist antislavery beliefs from the earliest years of his public career. Barring documentation that Lincoln affirmatively changed his position on colonization late in life – of which none has emerged – the core claim of the Butler anecdote is consistent with everything we know of the 16th president’s views on the subject. This entry was posted by Phillip W. Magness on Thursday, April 16th, 2015 at 8:44 am	and is filed under Uncategorized. You can follow any responses to this entry through the RSS 2.0 feed. Both comments and pings are currently closed.